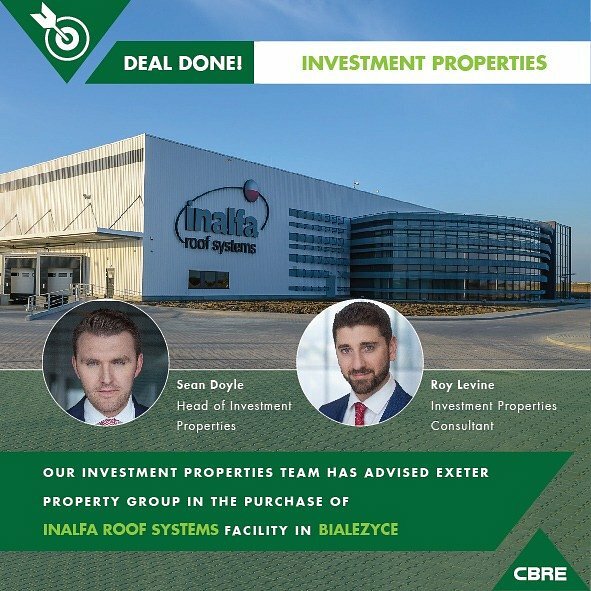 Exeter Property Group, a real estate investment management firm focused on logistic & industrial properties and portfolios across North America and Europe, has completed the sale and leaseback of a 9,315 sq m facility in Bialezyce from Inalfa Roof Systems. CBRE provided the buyer with advisory services during the transaction process. Inalfa Roof Systems is one of the world’s largest providers of vehicle roof systems. Inalfa designs, develops and manufactures sunroofs and open roof systems for the major OEM’s in the automotive industry. The company is headquartered in Venray, the Netherlands, and has a global footprint. The Polish facility comprises of 9,315 sq m industrial space and was opened in 2014 in Bialezyce village, near Wrzesnia town in Wielkopolskie Voivodship in west-central Poland, approx. 50 km from Poznan. The asset is currently being extended to provide an additional 2,800 sq m GLA expected by Q2 2017. The strategic location in Wrzesnia with easy access to the A2 motorway is one of its main advantages. The distance from Wrzesnia to Warsaw is almost the same as from Wrzesnia to Berlin (approx. 300 km). This deal is consistent with our company policy of constructing diversified, high-performing portfolios to deliver superior real estate solutions and risk-adjusted returns. Due to its excellent location and an attractive company profile, the Inalfa Roof Systems facility will be another attractive alternative asset in the Exeter portfolio. We also like the fact that part of the deal includes development of extensions of the Inalfa facility in two phases. This will allow our investors to achieve a higher rate of return. We are proud that we could represent Exeter Property Group in this transaction. This deal confirms that triple net long leases to reputable tenants remain one of the most sought after and highly coveted products in the CEE Investment market where shorter leases are more common. This fact holds true across all sectors and a wide range of asset types. We are looking forward to working with Exeter Property Group again in the future.